Reposted on 4/7/19 Throwback to March which is MS awareness month. Check out The MS Foundation and get involved. 1) How did you first learn about FearlessMS? SR Well, I was lucky enough to have Angela Cappetta contact me to do the Fearless MS ad. I was honored to be a part of the project. 2) Why did you decide to get involved? SR It was an easy decision to get involved. Not to mention, I have an aunt with MS and my father is on the board of an MS charity. So, it’s a big part of my family. 3) Has being the model for FearlessMS helped your own organization, Fashion’s Fight? SR Above all, yes, Fashion’s Fight is meant to reach out to a high-society fashion based crowd. Not to mention, this group loves their fashion news. 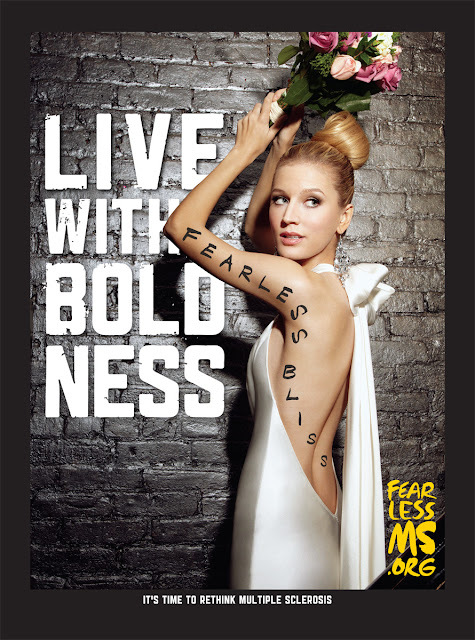 And any time someone spots a FearlessMS ad and recognizes it, it is actually helping promote Fashion’s Fight at the same time. In summary, it’s all about reaching as many people as we can. So, it’s a very good thing. 4) How do you feel about the pictures you star in? SR I love Angela’s work. She and the entire team were so much fun on set. Together with the whole vibe, I think it helped create an atmosphere for amazing work. 5) Why do you the characters you’re portray in the photographs communicate the need for people to rethink MS? SR I think all together we really captured the feeling of what MS can be to many people living with it. Furthermore, I don’t think people realize how MS can effect people so differently. And as much as people think models don’t “act” I was trying to set myself in the mood of determination, showing the will to fight in everyday situations. Shannon is represented by Elite Models in NYC. Contact them for info on booking shoots, speaking engagements or tv appearances.